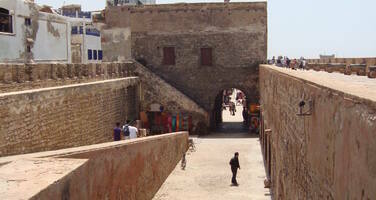 In close cooperation with the State Party, the World Heritage Centre organized a reactive monitoring mission from 7 to 17 September 2003 coordinated with an expert mission financed under the Italian Fund In Trust, to elaborate an integrated project for the safeguarding of the Medina of Essaouira. Since 1996, the Medina of Essaouira has undergone numerous interventions concentrated upon rehabilitation studies of several remarkable monuments (former Danish consulate, ancient Franciscan Portuguese Church, the 'maison de bienfaisance', the Simon Attias Synagogue, ancient foundouk, former French consular..) and the restoration of the West Bastion of the wall. With the provision of international assistance, awareness-raising efforts have been made by the State and the local community. These awareness-raising efforts for the population were based upon an informal structure, Agenda 21, that also coordinated and led several activities for the restoration of public buildings such as the monumental doors of the Medina, the Idid Souk, the Ethnological Museum and the part of the wall facing the sea. Despite these interventions, the general state of conservation of the property is a cause for concern. The construction of two commercial centres in front of the two principal entrance doors of the Medina, at the foot of the ramparts, in the "buffer zone" of the World Heritage property, has a negative effect upon the landscape values of the Medina. The built area is slowly becoming dilapidated. The lodging quarters are dilapidated, degraded by the wind and rain, and over-populated by the poorest inhabitants of the town unable to maintain the houses. The telephone and electric lines, television aerials, publicity signs all have a negative effect on the character of the quarters. The buildings in the north-west sector, the Mellah area, are very damaged, numerous houses are in ruin. The quarter does not enjoy essential services: adequate lighting, paving, garbage collection, sewage maintenance. Half the population does not have running water and 15% no electricity. This quarter which houses about 6,200 inhabitants over 4 hectares is the poorest of the Medina. In the face of this situation, the State has provided land and financial aid to 264 families who have been rehoused outside the Medina. Two other programmes concerning 200, then 600 families, are in the planning stages, but no action with regard to the quarter is programmed. The fortifications surrounding the Medina underwent restoration work on the land side. The wall and several monumental doors or bastions were reinforced. This work was funded by the State budget. Although the exterior aspect appears satisfactory, the repair of the rampart walk requires further work. The maritime zone of the North coast, exposed to weather and the effects of swell and tides, has suffered far more. The filling in of the underground excavations, the creation of an artificial protective reef offshore, and restoration work of the wall itself by the re-patching of the masonry are necessary. A development and urban management plan for the entire agglomeration and a safeguarding plan for the Medina, recently elaborated, are being approved. However, it does not mention the “protected zone” with regard to inscription on the World Heritage List, nor the “buffer zone” which accompanies it. The Centre was not consulted during the elaboration of the plan. The mission noted the need for a specific body competent to oversee the property and its protection. The municipal services and local representatives of the different ministries concerned (Culture and Housing) lack the means to carry out these tasks. To respond to this situation, the World Heritage Centre has identified a general intervention programme concerning the indispensable urban developments (in particular the provision of water and sewage services, the need for which was reported in the framework of the UNESCO programme “Urban development and freshwater resources in small and medium-sized coastal cities”) and on safeguarding and presentation work of outstanding buildings within the property. f) A certain number of accompanying actions including the creation of a body responsible for the safeguarding of the Medina. The cost of the project was provisionally estimated at US$4,850,000. In March 2004, the World Heritage Centre transmitted this information to the World Bank, which is presently preparing an intervention project on historic cities of Morocco. The organization of a workshop on heritage management for the Medina of Essaouira and the control of its buffer zone is envisaged to allow all the actors concerned to undertake efficient measures for the safeguarding and presentation of the property. Basically intended for local actors, it will bring together the principal players involved in the conservation of heritage: Province, Municipality, Delegations for Culture, Development, Urbanism and Housing, ONE, Morocco-Telecom, Agenda 21, the principal local associations, local personalities, representatives of the major donors (IBRD, U.E., AFD, Belgium, Italy, Germany). The workshop has as objective the elaboration of a recommendation to the authorities concerning the creation and the functioning of a specific body for the protection and presentation of the Medina. The World Heritage Committee, 1. Invites the State Party to take steps towards creating an administrative and technical body responsible for the property with the aim of maintaining its architectural and urban quality; 2. Encourages the State Party to undertake steps with the World Bank to integrate the “Safeguarding and presentation project for the Medina” in its programme for the “revitalization of the historic centres of Morocco” presently under preparation; 3. Requests the State Party to submit to the World Heritage Committee, by 1 February 2005, a report on all the work in progress in the protected zone and the buffer zone which threaten the integrity of the property, for examination by the Committee at its 29th session in 2005. 3. Requests the State Party to submit to the World Heritage Committee, before 1 February 2005, a report on all the work in progress in the protected zone and the buffer zone which threaten the integrity of the property, for examination by the Committee at its 29th session in 2005.